Premiering in 1980 as Deathstroke the Terminator, Deathstroke quickly gained enough popularity to warrant his own comic. He originated as a U.S. Marine named Slade Joseph Wilson, achieving peak physical prowess before being enhanced through experimental testing. A mercenary by trade, he wears a mask split into two sections, one side black and sparse of detail, the other orange and often scowling. Here at Superheroes Direct, fans of this supervillain can find all the Deathstroke gear to suit their needs. We offer adult costumes and latex masks perfect for dressing up as your favorite mercenary for the day, as well as t-shirts featuring eye-catching graphics and collectible POP figures. Keep checking back here at Superheroes Direct for more upcoming Deathstroke apparel. In Arkham Origins and Arkham Knight, Deathstroke appears as a mercenary assassin and antagonist of Batman. 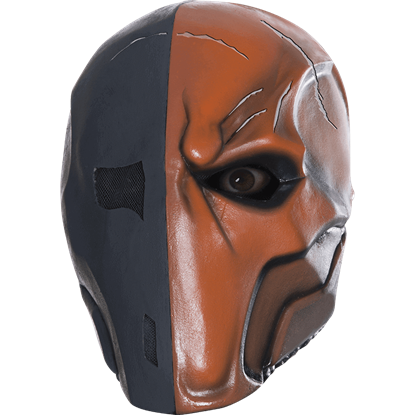 The Arkham Deathstroke Deluxe Latex Mask makes a great start for building your own Deathstroke costume this Halloween. Present in Arkham Origins and Arkham Knight, Deathstroke appears as a mercenary assassin and antagonist of Batman. 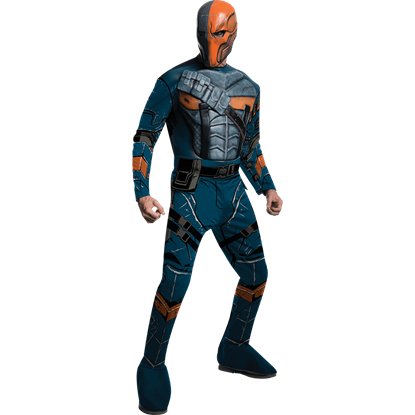 Fans of the popular video game franchise are sure to enjoy the Mens Arkham Deathstroke Costume this Halloween.